Part of the NUS Arts Festival 2014, Moveable Feasts is a visual arts exhibition that took place from 14 to 28 Mar at the University Culture Centre. The combined efforts of about 20 attempted to trace the changes of food in Singapore over the years and remember history (or to leave a memory of today for the future generation) through photographs. It revolved around the diversity of local breakfast, our love for spice in chilli crabs and laksa as well as preserving traditional bakeries, desserts and nonya kuehs. 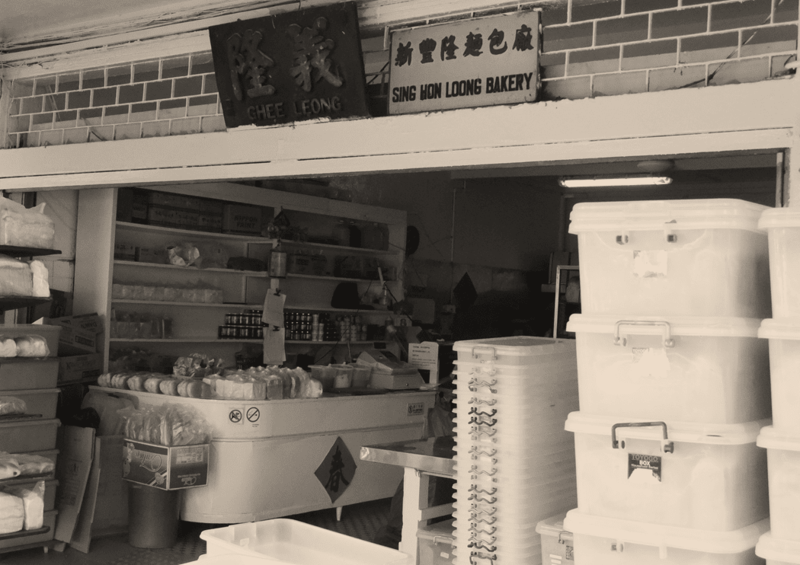 The boss of this traditional bakery at Whampoa Drive, off Balestier Road, was not around when we visited on Saturday morning. But we spy the same brown breads in plastic containers, seen in neighbourhood coffeeshops where kaya toasts are served with half-boiled eggs and coffee or tea. We trooped over to another traditional bakery at Kim Keat Lane but the boss declined to be interviewed and suggested we go to the one along Upper Paya Lebar instead. 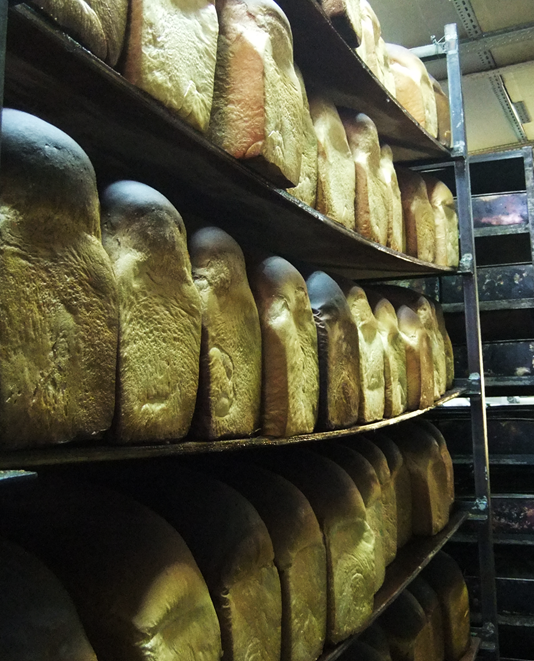 So here we are, as you can see from the traditional loaves of breads and the pans or moulds they are baked in. 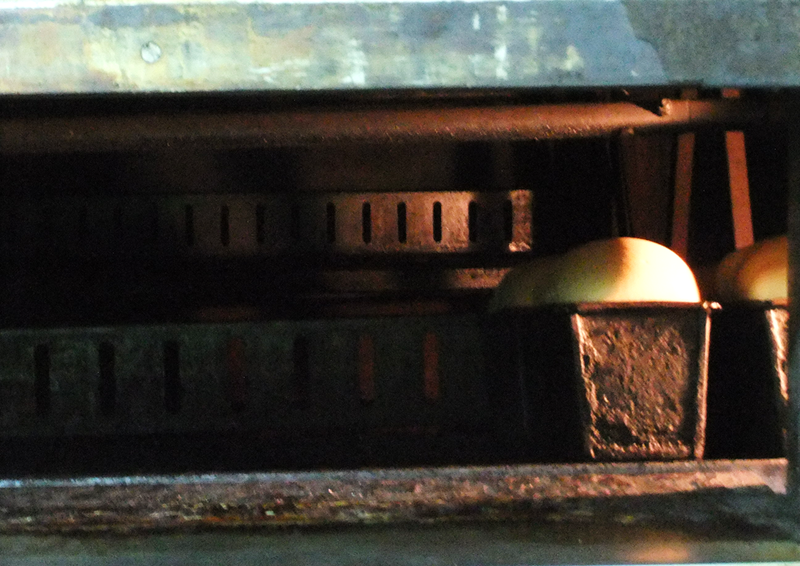 …and before it is baked in the oven, a rotating one in this case. There are 8 racks and each can hold up to 28 bread pans. Baking temperatures and times differ according to the types of breads – round top, square loaves, baguettes and buns. As such, only one type is baked in each batch. Crust on one of the loaves is no longer intact but it does not matter since most will be “trimmed” away. 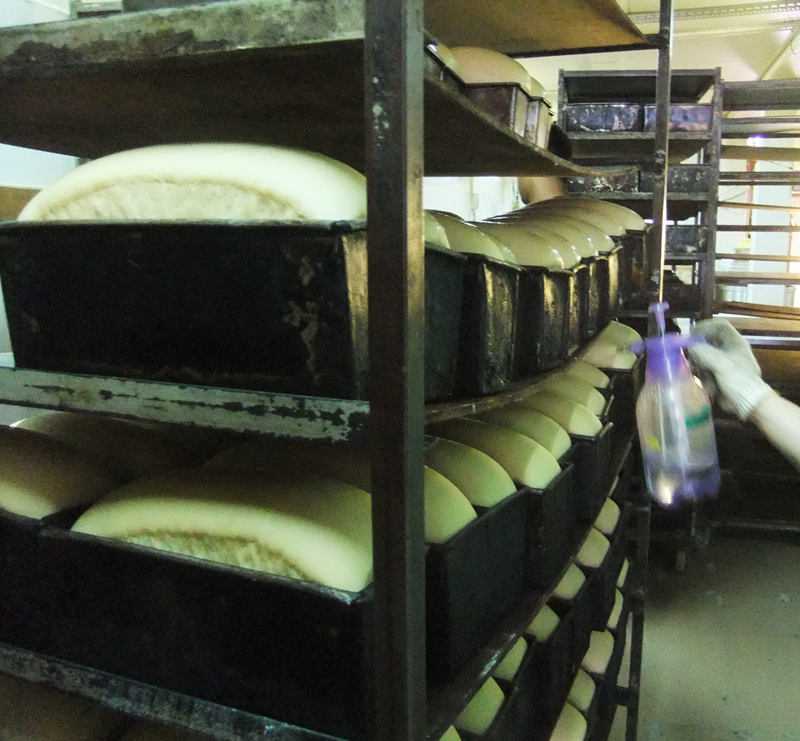 Because this is done manually for breads with the signature charred round tops due to the irregular shapes, these have not been commercialised by Gardenia, Sunshine and the likes. Unlike square loaves baked using the same bread pans but with an additional lid so the dough does not rise above the top. 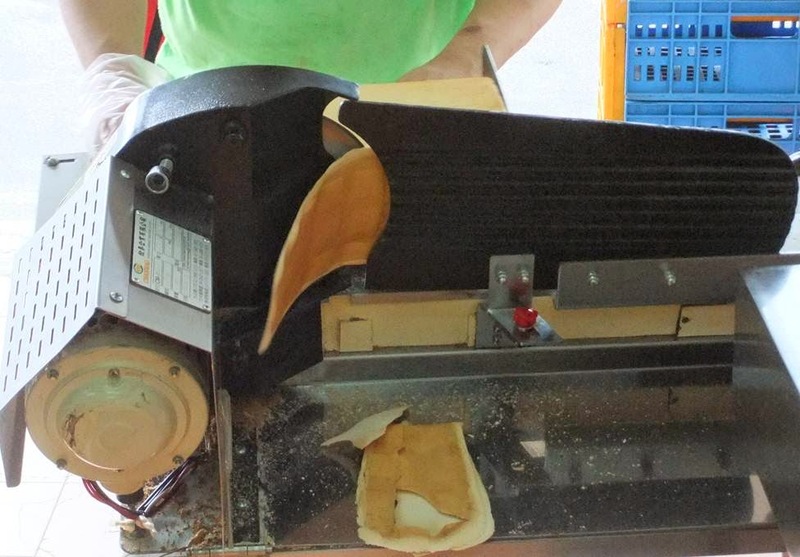 Its crust or skin can be “trimmed” off using a cutter with adjustable thickness, reminiscent of a ham slicer. “Trimmings” are recycled in two ways. 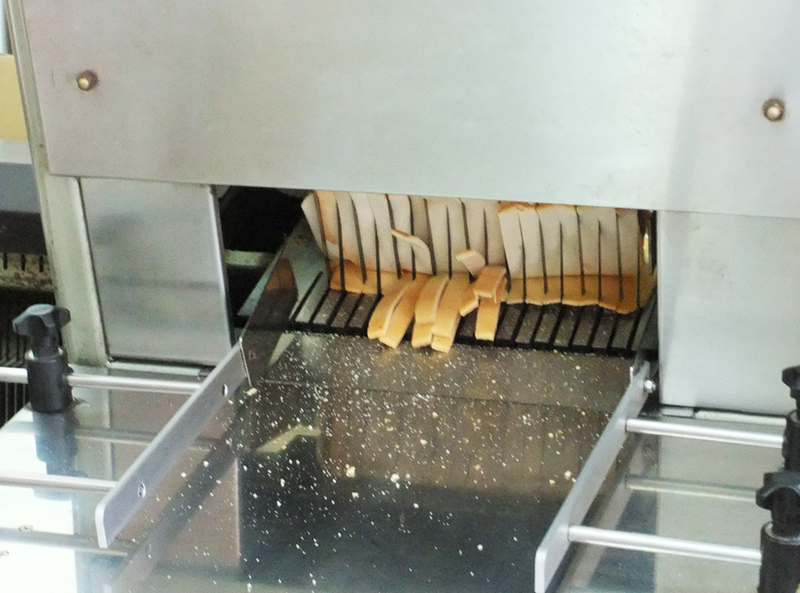 One is to clean the bread slicer before breads are cut into slices. 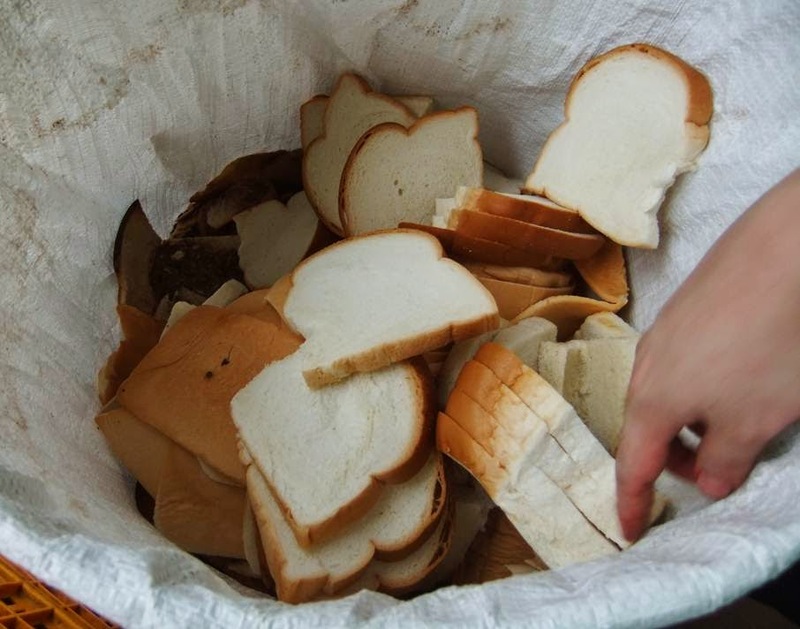 According to the boss who took over from his employer 28 years ago, not all clients (used to include a well-known kaya toast chain too) – coffeeshops, bakeries and ice-cream cart vendors, wants sliced bread without crust. Ah…there, we see the white breads coming through. Best eaten as-is or steamed, and softer than the brown ones, which have an aroma of molasses when toasted. These, the colourful ones used to wrap ice-cream and baguettes are packed into transparent plastic bags with no labels. 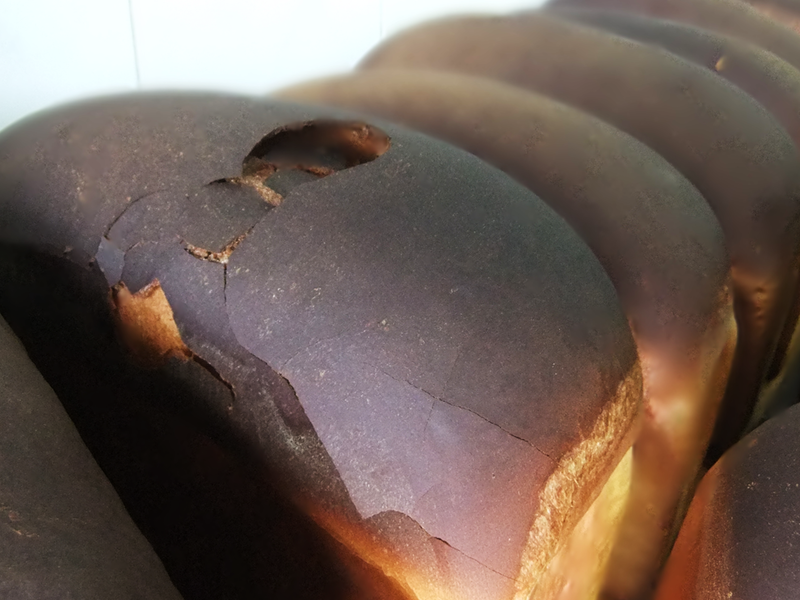 Freshly-baked with no additives, the breads are discarded after a day. No, you do not have to stuff your face finishing the breads you bought as they can last up to three days. Together with the “trimmings”, they are sold cheaply to fish farms as feed. 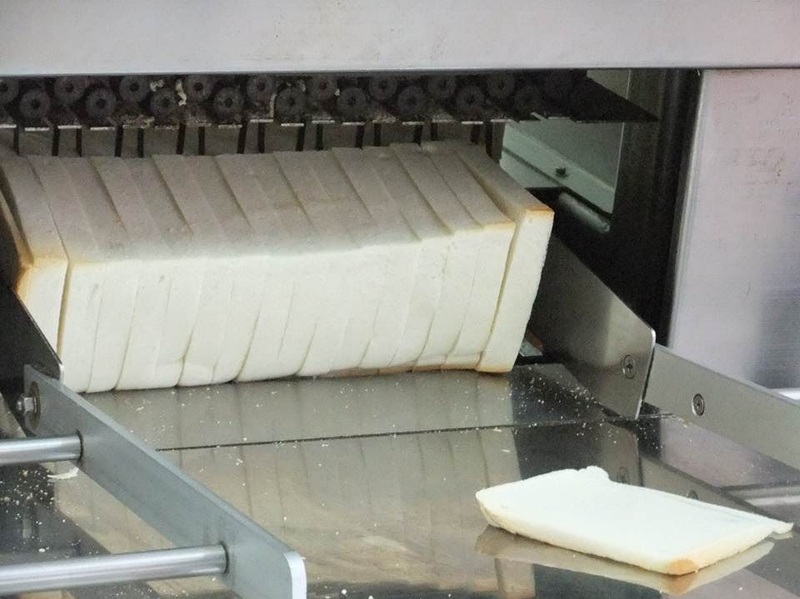 You can buy mini square loaves of milk and wheat bread at this 24-hour bakery. Or have a traditional loaf spread with kaya, peanut butter, margarine and/or strawberry jam. 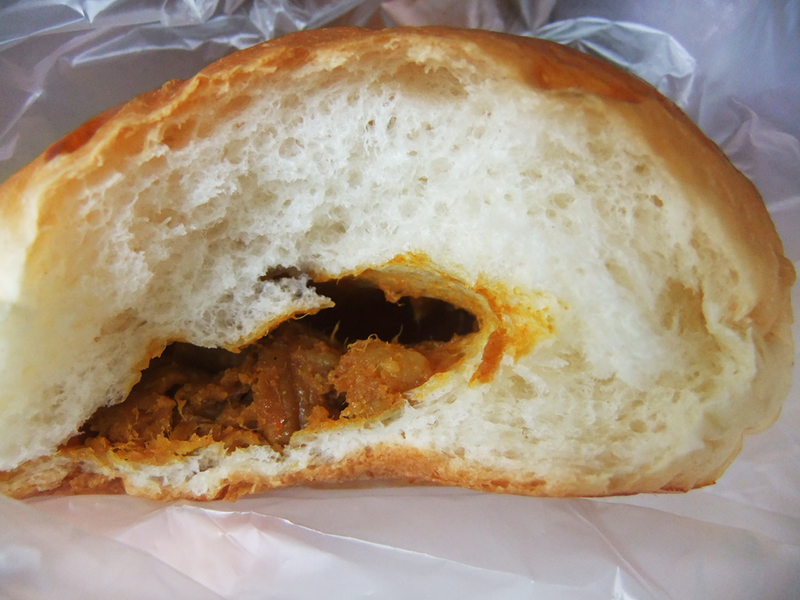 My choice of curry bun was nostalgically yummy with airy-soft insides well-balanced by spicy curry filling. Jie Bakery & Confectionery, thank you for your time and patience in answering our questions and allowing us to take photographs.